I have been using protein powders for years, but stopped taking whey protein powders a long time ago because they just didn’t agree with me. Whey can be difficult to digest and if you don’t tolerate dairy well, like me, it’s always been a bit of a no-no. Enter, KIN. 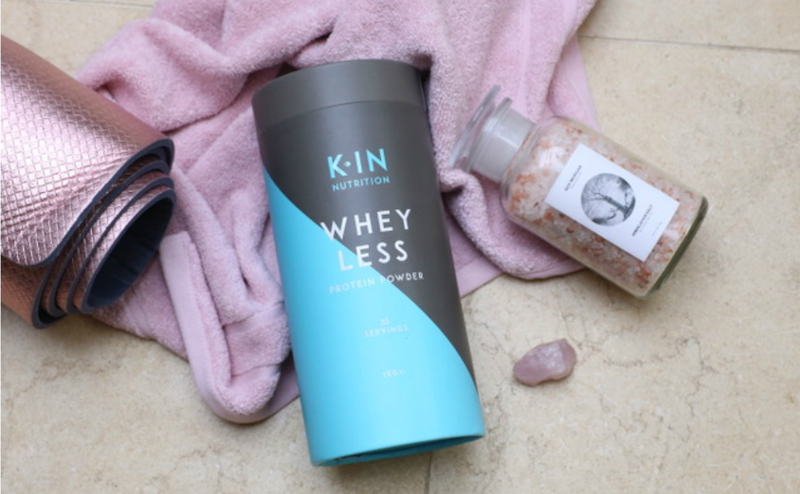 KIN add probiotics (good gut bacteria) and fibre to their WHEY-LESS protein powder range which makes it much gentler on the stomach, and thus easier to digest. It’s rare that I am truly taken by a product but I have been genuinely impressed by their product range. I have been through my fair share of powdery and gritty protein powders that were full of artificial sweeteners and tasted nothing like they said they would. It is therefore SO refreshing to find a product that delivers on both taste and texture. When it comes to mixing protein powders with just water, texture is right up there on my importance list and I doubt you will find a smoother blend than this one (I’ve mixed with water in a shaker bottle, and with my nutribullet). My personal favourite is the WHEY-LESS Choc Mint because it actually tastes like mint choc chip ice cream, which is pure heaven. Not only that, it contains 125 calories, 23g of protein and only 4.7g of carbohydrates (of which 0.2 g are sugars). This is perfect to hit your protein requirements without adding excessive carbohydrates. If you’re on the hunt for a new protein powder, especially if you have struggled to digest one before, I couldn’t recommend KIN enough.